Central Corfu extends from the western shores up the area around the capital of the island.It includes the villages Agioi Deka, Stavros, Agios Gordios, Kastellanoi, Sinarades, where the archaeological and folklore museum of Middle Corfu is loacated, and Pelekas with the popular beach of Glyfada. This region also includes the Achillion, the famous, imperial palace. 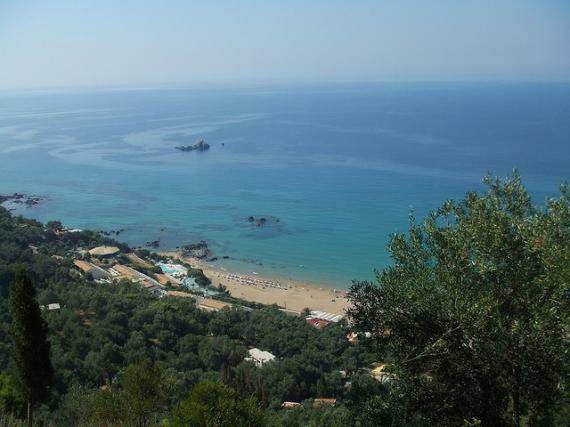 In the central part of the Corfu, you'll discover the village of Sinarades, located on a hill. In this area, the residents used the land for farming, but nowadays it's a popular holiday resort with hotels, villas and apartments. The beach of Agios Gordis now covers a large sandy area, while at its north end there's the Baloon, from where you can watch a magical sunset. Today, the old village of Sinarades is a picturesque spot with a folklore museum, reminding of the beauty of the Greek islands in all their uniqueness. Meanwhile, the cosmopolitan Glyfada Beach is an oasis during the summer months. On a hill full of olive and cypress trees, the beach provides a breath-taking setting as there are only two villages nearby; Pelekas and Vatos. A much smaller and secluded beach is Myrtiotissa, which is an unofficial nudist beach. Throughout the day, families gather here while young groups of friends meet and have fun in the bars of the area. Kanoni is one of the most famous sights of the island, as it's the spot where the ancient town of Corfu was built in the 8th century, including the temple of Artemis, other major monuments and the Acropolis in the current position of the Ascension. An interesting fact is that the hill hosts a wall piece that is considered to be 2500 years old. The inhabitants often find cannon balls and pottery when digging their gardens. The Kanoni area took its name from a cannon that was placed by the French in 1798 to strengthen the protection of the island, standing on the same point until today. The area has gravel beaches and an excellent view over Pontikonisi (Mouse Island) with the Pantocrator monastery up to the monastery of Vlacherna that is connected by a small bridge.